Sadly, most people have cereal and milk for breakfast every day. This is sad because cereal and milk are some of the worst things to put in your body (if you actually want to feel good and have energy throughout the day). I have so many patients complain of lethargy and lack of energy, and the overwhelming majority are eating milk and processed sugar for breakfast. It still surprises me that I have to tell people why these things aren’t good for you. However, I do. Cereal is fairly obvious in that it’s virtually all sugar. Sugar is ok if it’s from a good source like fruit. It’s bad if it’s been refined and processed. You get none of the natural nutrition and just the extra calories. The sugar floods the bloodstream and causes the pancreas to work in overdrive at releasing insulin to clear the sugar from the blood and get it into the cells. Refined high-glycemic foods are the reason we have so much type II diabetes in our society. Dairy is inflammatory. Period. There are a lot of good things about milk, but they all come with the price of chronic inflammation. Human bodies aren’t built to be consuming dairy other than breast-milk as young children. Our calcium and vitamin intake can easily be fulfilled by vegetables, fruits, fish, and nuts. This is coming from someone who LOVES milk. I love the taste of it. It’s wonderfully refreshing. However, I can’t argue with my body. My energy was zero when I was consuming milk and cereal. I was literally tired all the time. My wife and I now start out every day with a smoothie. The ingredients vary sometimes, but usually are frozen strawberries, frozen blueberries, a banana, and some orange juice. We’ll usually have some eggs with it, and since we’ve ate like this, we both have a great amount of energy throughout the day. Rather than trying to justify why milk and cereal are good to consume, just try it for a week or two. Make yourself a smoothie, have a couple hard-boiled eggs, maybe a handful of nuts, or some leftover salad or salmon from the night before. No one says breakfast can’t be leftovers. Anyways, you’ll notice wonderful benefits almost right away when you eliminate milk and cereal from the diet. Just try it… you might like it! Good article on some of the benefits of fasting. It seems cancer cells don’t tolerate fasting as well as normal, healthy cells. Well I’ll just let you read it… Enjoy! 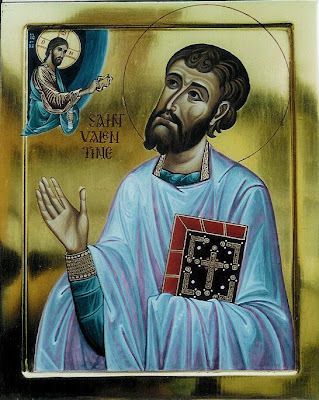 “The ancient martyrology of the Church of Rome marks February 14th as the remembrance of “the martyr Valentine, presbyter of Rome” (Valentinus means “vigorous” in Latin). Unfortunately the historical data for the saint is incomplete. Saint Valentine lived in Rome in the third century and was a priest who helped the martyrs during the persecution of Emperor Claudius II the Goth. The great virtue and catechetical activities of the Saint had become familiar. For this he was arrested and brought before the imperial court. Then Claudius brought the Saint to another judge. He was called Asterios, and he had a little girl who was blind for two years. Listening about Jesus Christ, that He is the Light of the World, he asked Valentine if he could give that light to his child. St. Valentine put his hand on her eyes and prayed: “Lord Jesus Christ, true Light, illuminate this blind child.” Oh the great miracle! The child saw! So the judge with all his family confessed Christ. Having fasted for three days, he destroyed the idols that were in the house and finally received Holy Baptism. Fifteen centuries pass and we arrive at 1815, at which time the divine intention was to “disturb” the eternal repose of the Saint. Then the relics were donated by the Pope to a gentle Italian priest (according to the custom of the time). After this the relics are “lost” again until 1907 where we find them in Mytilene in the Roman Catholic Church of Our Lady. It seems that after the death of the priest that a descendant of his had inherited the relics who had migrated to Mytilene, which was then a thriving community of West-European Catholic Christians. There they remained until 1990 when they were moved to Athens in the Church of Saints Francis and Clara’s Italian community, where they are today. We should first say that there is not sufficient information on the national origin of the Saint, though there are some other (shades of) evidence that the Saint was of Greek origin. For example, the earliest depiction of the Saint bearing the inscription «O ??? ?C BA?????? ?C” in Greek, is in the Church of Our Lady the Ancient (Santa Maria Antiqua) of the 6th century which was the parish of Greeks in Rome. The church particularly venerated saints who were Greeks and generally from the East. The decoration and renovation of the church was ordered by the Greek Pope John VII (705-707) and finished by his successors, including the last Greek Pope Zacharias (741-752). But perhaps it is no coincidence that after seventeen centuries, the remains arrived in Greece. The issue here still requires research. Many, however, raise the objection that St. Valentine is not mentioned anywhere in the calendar of the Orthodox Church. Indeed on 14 February in the calendar of the Church there are commemorated Saints Auxentios, Maron and the martyrs Nicholas and Damian. The explanation is simple: in ancient times hagiographic directories, biographies and martyrologia were written to be primarily used locally in their own character, and the fame and reputation of a saint locally does not mean that it extended also throughout the Church. So there may be saints honored widely in one region and completely unknown in another, eg, St. Demetrios, who is famous throughout the Eastern Church, yet in the West is not honored at all, and is almost unknown, but this does not mean that he is not a saint. Another example of the modern Church: St. Chrysostomos of Smyrna († 1922) who in Greece is known, yet in Russia is completely unknown, but this does not mean that he is not a saint. I’m excited to announce that I’ve purchased some new tables in the last week. The first table is a flat bench. 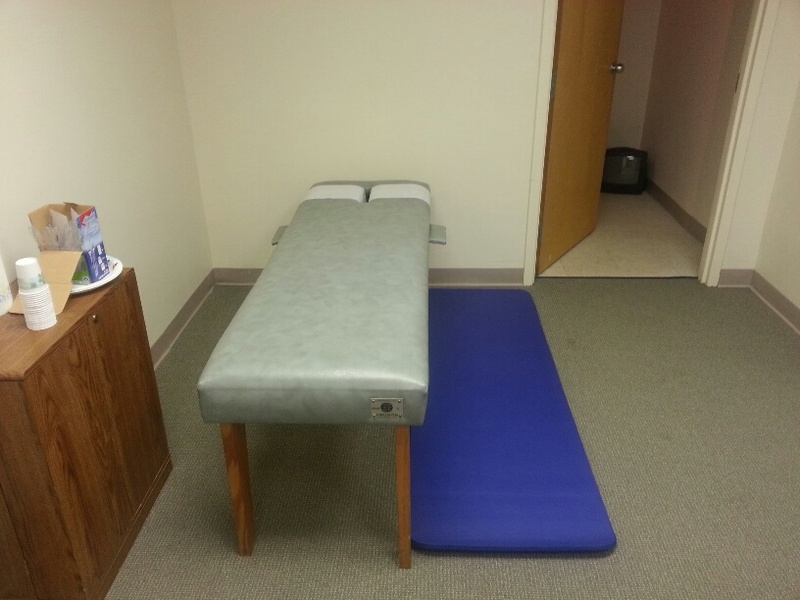 This table works well for simple passive therapies (ice, heat, electric stim). I didn’t intend on purchasing one now as I haven’t even received my stim unit yet, but when buying the other table, they made me an offer I couldn’t refuse. The other table is an Activator Hi-low table. This table is especially good for using the Activator Methods system of adjusting. 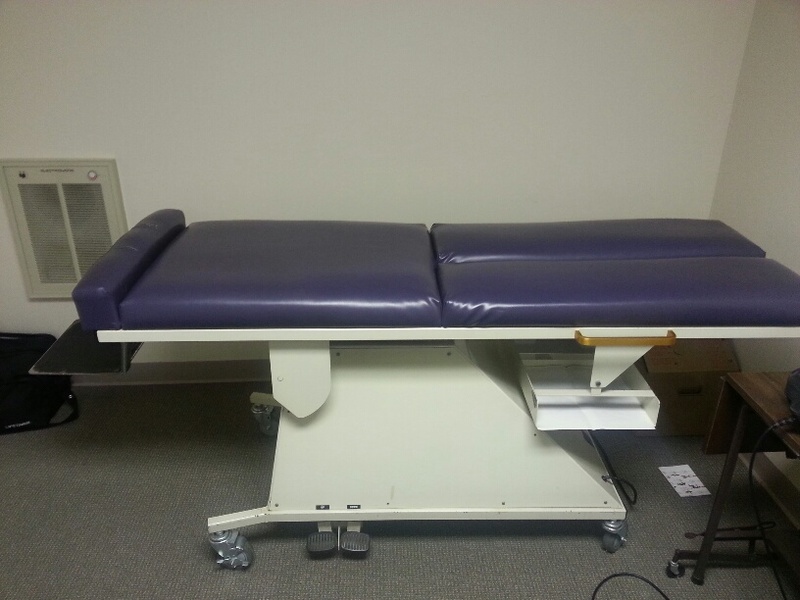 I don’t use it on many patients, but it’s very helpful for those who don’t want to be “twisted” or “popped.” Additionally, the table is very helpful for elderly or acute patients, who have a difficult time climbing on/off an adjusting table. It needs some cosmetic work to get it up to par, but overall is generally in good condition. The hi-low function works by having the patient stand on a platform, while the table is then lowered down, and the platform then automatically lowers after the table is fully horizontal. I’m very happy with the purchases so far! Eating healthy doesn’t mean avoiding fats in your diet. Your body actually requires fats to function optimally. The individual cells in your body are coated in a lipid membrane. Many important processes involve the movement and communication through this membrane. Staying hydrated and getting a healthy supply of good fats can help to keep the cells communicating properly. Avocados, extra-virgin olive oil, fish oil, coconut, seeds, and nuts (other than peanuts) are all examples of healthy fats that should be a daily part of meals and snacks. Try consuming more of these on a daily basis and see how much your body appreciates it! It seems that there are a lot of bugs going around now. Everywhere I go, someone is saying they’ve been sick or their family is sick. A common misconception is that people are getting sick due to it being colder. Well that may be partially true, but the main contributing factor is now thought to be attributed to the winter humidity. When the air is very humid, the particles in the air attach themselves to the moisture in the air and due to their new added weight and gravity, they fall. In winter, without this moisture, many of the particles simply float or linger for a longer time. So if picking up a bug has more to do with being exposed to the bug, than simply making poor decisions with staying warm, there must be a reason some get sick while others do not. This has to do with the efficiency of the body in fighting off the bugs. The more efficient the body is functioning, the better chance you have of fighting off a bug which you will inevitably be exposed to. Several simple things that can help with functioning well. Get a good amount of sleep. Getting 6 to 8 hours of sleep a night is essential for most of us to properly function. The body needs time to repair itself after a day of usage. Additionally, during sleep is when the spinal discs decompress. After a day on your feet or in a seated position, the discs naturally get compressed. When you lay on your back, the discs have a chance to expand and decompress again. This is also why most people are 3/4 of an inch taller in the morning. Proper rest contributes to a properly functioning immune system, which will be the most effective tool in battling viruses. Most people drink when they feel thirsty. The mechanism for thirst is based on survival, but not necessarily optimal health. Your thirst mechanism will keep you alive if you heed its warning, but in order to function efficiently, you’ll need to be a little more intentional. If you’re not used to drinking much water, just start small. Several juice glasses full of water a day… then move to a juice glass an hour. I see many patients with active symptoms which will significantly decrease after they hydrate themselves well. Additionally, think of a stagnant pond vs a flowing stream. Which water is safer to drink from? The flowing water. The human body is composed mainly of water. A constant flow of clean water helps to keep the fluid cycle fresh. This also simply keeps our cells hydrated and healthy. Most people don’t get much sunlight when it’s cold outside. Sunshine is our natural method of acquiring Vitamin D. “Vitamin D boosts immunity by stimulating production of cathelicidin, an antimicrobial protein that serves as a “natural antibiotic” in the body,” said Michael Zasloff (a professor of surgery and pediatrics at Georgetown University Medical Center). I take 5000 IUs daily. This is much more than the recommended amount. I’d rather have too much than not enought though. As long as I’ve been faithful with this, I’ve never gotten sick. That’s not to say Vitamin D is the cure when you are sick. It’s the prevention that keeps you from getting sick. This one is very simple. A 30-40 minute session of cardiovascular exercise will increase cardiac output, heart-rate, and blood flow. When you exercise, your body increases white blood cell numbers and circulates them more quickly through your body. Increasing the cell numbers and circulation helps the white blood cells to be victorious when they come across a nasty foreign invader. These are all relatively well-known methods of staying well, but sometimes a reminder helps. Happy New Year to everyone. Stay healthy!